When babies reach the end of their first year milestones, one of the significant fine motor skills to learn is the pincer grasp. This is the skill of picking up something rather small or thin by using the thumb and first finger of the same hand. Often parents feed baby a bowl of cheerios to teach them this skill since baby has to pick up each tiny “O” with their thumb and first finger. One of the challenging aspects of this skill development is letting go of the object. For example, a baby needs to learn how to pick up the cheerio, put it in her mouth and then let go. Sometimes babies learn to pick up coins and drop them into a water bottle. 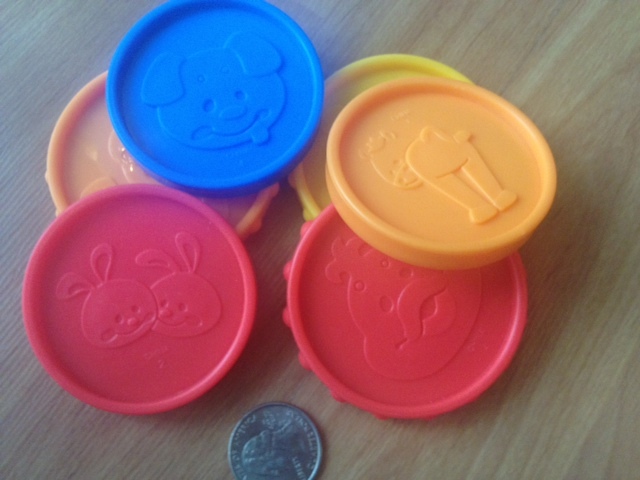 However, coins are small and may be a choking hazard so a baby should only use coins when very closely supervised. In the photo below you can see the size of a real quarter next to the fake coins for this piggy bank. The larger coins are safer and good practice for developing finger dexterity. Soon, parents can closely supervise baby as she tries picking up real coins which will develop even more skill due to their smaller size. One of the best baby toys to develop the fine motor skills of the pincer grasp and letting go of an object is the Fisher-Price Laugh & Learn: Learning Piggy Bank. It is also a great toy to begin teaching baby how to count and colors for toddlers. In the above video from PunkFarter’s youtube channel, the baby is learning to pick up the coin and push it in the slot. It requires a considerable amount of finger dexterity to line up the coin with the opening. 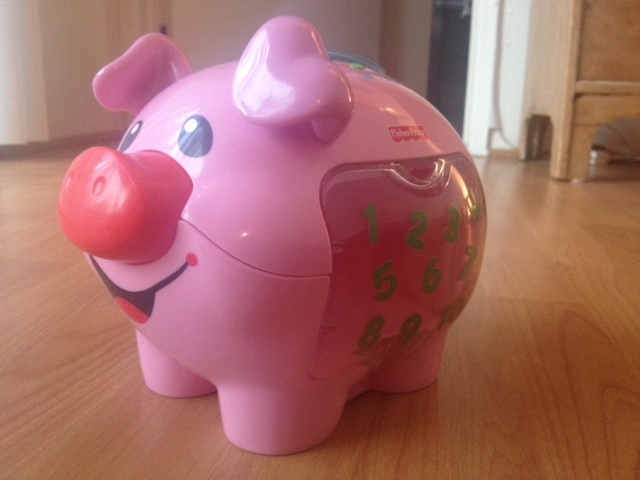 When this piggy bank is switched to one of the “on” settings, the pig counts when each coin is deposited, “1……2…….3,” etc. The second of the two settings plays a song which is to the tune of “The Farmer in the Dell.” I often encourage parents to do what they have done in the above video which is to either turn the toy off/remove the battery and create the sound effects yourself. Babies love to hear these unexpected sounds and may eventually may try and make the sound themselves! 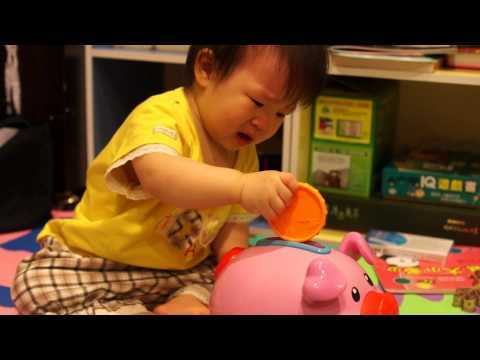 Babies love to put coins in a piggy bank. This is an advanced skill that falls into the motor skill of grasping and reaching. It actually grasping, reaching, and letting go. Baby learns to pick up a coin, reach it into the bank or coin slot, and then opens her fingers to let it go. Sometimes babies learn to put the coin into the slot but do not know yet how to let it go. 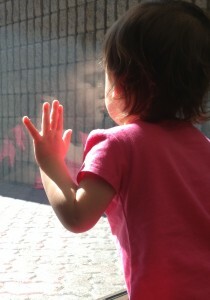 When a baby reaches out to get a toy she must both reach with her arm and grasp with her hand. To place an object into a box or a coin into a slot she must take the object she is grasping (i.e., coin) and reach it into the slot and then let go of the grasp (open her fingers). The 13 month old baby in the above video from Jerry You’s youtube channel has learned this skill quite well. The baby tires at one point and asks the mother to do it for her. The mother gently tells the baby to go ahead and do it herself. The piggy bank provides babies such as the one in the video much time for baby play. Simple piggy banks can be made at home with everyday objects. An empty water bottle is often used in large mommy and me classes. The opening fits a penny easily. Just place the coin in the narrow opening at the top and watch it fall down to the bottom. Another option is to use an empty carton from something such as milk. A lid can be made from a paper plate which is cut to size and has a large slot cut out of it. Tape this to the top of the carton and sit it on the ground while baby puts coins into the opening. When traveling, on vacation, at the museum, etc., show baby how to drop coins into a fountain or the donation box near the exit. Pay close attention so the coins do not go into her mouth! As a baby develops motor skills of crawling and walking that allow her to move around and explore, she soon begins to look back at mom to see if it is OK to play with unfamiliar objects or to go around new corners. In child development this behavior of looking back to a parent to see if something new or unfamiliar is OK is called “social referencing.” Babies and children look to the adults they trust to provide them with clues to safely guide their explorations. The clues often come from the parent’s non-verbal behavior, in particular the facial expression. Joseph Campos of the University of California at Berkeley conducted the now classic baby experiment that investigated the role of facial expressions in providing infants with the clues of whether or not to proceed when faced with the unfamiliar. Using an experimental strategy developed in the 1950s called the Visual Cliff, he created a situation that was unfamiliar and somewhat frightening for the babies. Infants between 9 and 12 months are placed one at a time on a plexiglass table with a checkered pattern. In the middle of the table is a visual drop off which is created by replacing the checkered pattern table top with a strip of clear plexiglass. This created the appearance of a sudden drop in the table although the surface is completely uninterrupted. The baby is placed on one side of the table while the mother stands on the other side while holding an appealing toy. When the baby crawls to the center strip where the drop off appears, they sense they change and the potential danger. They look to their mother to see what to do. In the visual cliff experiment, the mother makes either a fear face or a smile/encouraging face as directed by the experimenter. In most cases the baby responded to the fear face by choosing not to cross the visual cliff. The mothers were trained to make the fear face by raising their eyebrows, widening their eyes, and opening their mouth. When the mother posed a smile or encouraging face the baby confidently crossed the visual cliff to reach the toy. Watch the above video from vooktv’s youtube channel to see the experiment in action. 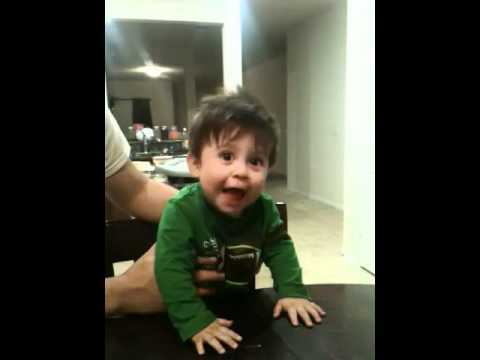 Parenting tips learned from this experiment include being clear to make an encouraging face when you child is trying something new that is positive and safe and making a fear face when the child is considering an action not desired or dangerous. Spend some time looking in the mirror and exaggerating these facial expressions so they become very obvious. Observe your baby to see when she looks to you as if to ask, “Is this OK?” Provide clear clues for your baby as she explores the world around her. This gives baby confidence to explore, play with a new object, by held by an unfamiliar relative visiting from out of town, and more.